New Delhi: The taxman is placing greater trust in taxpayers, a top government official said, picking up a smaller chunk of overall returns for scrutiny. In 2017-18, the tax department picked up for scrutiny only 0.35% of all tax returns, compared with 0.8-1% in the previous years, Sushil Chandra, chairman, Central Board of Direct Taxes, said. The lower percentage of scrutiny means the department is looking at more non-intrusive ways to check tax evasion. “Of the 0.35% cases picked up, around 0.15% were picked up for limited scrutiny. Only 0.2% of cases were picked up for full scrutiny," Chandra said at a conference organized by the Associated Chambers of Commerce and Industry of India. “This shows the faith the tax department has in taxpayers. But it doesn’t mean that tax evaders can go scot free," Chandra said, adding that technology will be used to mine data to identify tax evaders. 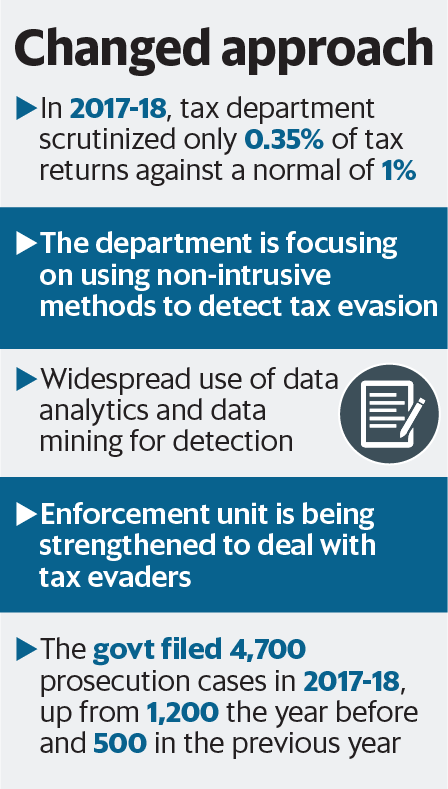 The tax department is also strengthening its enforcement unit to deal with tax evaders. Chandra said the government had filed 4,700 prosecution cases in 2017-18, as against 1,200 the previous year and 500 in the year before that. The taxpayer base has also expanded. The government received 68.6 million income tax returns in 2017-18, against 54.3 million in 2016-17. This number is expected to substantially increase this year as implementation of goods and services tax helps improve compliance on the direct tax side due to greater formalization of the economy. Amit Maheshwari, partner, Ashok Maheshwary & Associates Llp said even though the tax department has reduced scrutiny notices, it is sending more notices under Section 148, helped by data analytics. The section gives the assessing officer power to either assess or re-assess taxable income for the last few years. Chandra said the tax department issued 309,000 notices last year on the basis of demonetization data.